Pass this to your fellow man and never, never, surrender it to the opposition! Blackpool have spent most of their inaugural Premier League season sticking to a passing game that was at the centre of their promotion from the Championship. It forms a part of the slightly patronising term, ‘a breath of fresh air’ as teams generally ‘shut up shop’ or as Stoke did ‘go direct’. Enough of the vague cliches now and the focus will turn to facts. The facts about Blackpool this season is that they’ve passed the ball very well, all players (goal keeper inc) are encouraged to pass the ball with the aim of keeping possession. Ian Holloway has openly cited the style of Spain and Barcelona as the target for his ever improving team. In taking this approach Blackpool have attempted 8,507 passes this season completing 75% of all their passes (up to and including Man City away). This is an admirable achievement for a team that prior to the season starting was written off as certain relegation candidates by some of the media. As the plaudits have been heaped on Blackpool for this superb application of the passing game it is something that everyone at Bloomfield Road should be proud of. What this blog post is going to try to do is to try and second guess what Ian Holloway might be trying to work on with his team as the second half of the season gets under way. Holloway has said that he wants to improve on what he and his team does and with this in mind he’ll be seeking to squeeze more out of his team as the season unfolds. Whilst Blackpool’s pass completion has been around the 75% mark, some games have been characterised by the Seasiders struggling to close out the game, losing leads and conceding late goals. The games against Blackburn, Fulham, Bolton, Wolves and Villa (and this week Birmingham) spring to mind. Holloway will no doubt be asking himself why this is going on and whilst there are valid and pertinent arguments for pointing the finger at poor defending, there may be a tale within the Blackpool passing stats that might show the way forward. Let’s illustrate this through reference to pass completion stats from the quarters of games. The best of and the worst of Blackpool’s pass completion are listed in the table below. You can see where Blackpool have had their best and worst quarters of passing whilst in the Premier League. It can be seen that Blackpool enjoyed the best pass completion quarters in the game against West Brom, understandably so, given that Blackpool were playing against nine men. Less men to pressure the ball leads to more time on the ball and less misplaced passes. However, some of the other best pass completion quarters are against the sides that are more renowned for passing the football. 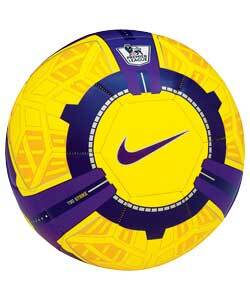 Two of them took place at the Emirates, however, here lies more about the story of the game. Blackpool were walloped for six and at times, even though Blackpool passed the ball around well, Arsenal were content with them doing that. Also another of the best quarters was away to Chelsea when again Blackpool were swiftly put to the sword and the opposition were content to let Blackpool retain possession. However, the stand out quarter is the one in tenth place as Blackpool played some superb passing football to dominate the first half at Anfield. A look at the worst quarters starts to give Blackpool some insight in to where things have gone wrong at times this season. The worst quarter of passing that the team has seen occurred at Anfield and in fact the worst three quarters all occurred in away games. However, that gives us no insight in to why pass completion dropped. In fact looking deeper at those instances and placing them in to context allows us to understand what went wrong. Liverpool came out for the second half two down and scored early. They pushed hard for a second and in doing so worked hard to close Blackpool’s players down and forced mistakes. Against Newcastle, Blackpool were again leading and coming out from the break freshly addressed by Chris Hughton they upped their work rate to force more mistakes from Blackpool. However, it is the fourth worst pass completion quarter that gives an insight in to what can go wrong when a team starts to misplace passes. That quarter occurred in the final stages of the game against Bolton, where Bolton applied pressure, Blackpool dropped deeper, clearances became wild, legs tired as did minds and as concentration slipped so did the passes until they conceded a late equaliser. Two of the ten worst quarters occurred in the Blackburn game, where they stifled Blackpool and forced them in to hitting long balls, which played in to their hands. It was also, one of Blackpool’s worst performances and with an overall pass completion of 67% also the worst passing performance of the season. From left to right, the pass completion % has been charted for each 15 minute quarter of the game. As the game progressed, you can see how Blackpool's pass completion dropped in the last Quarter as Bolton applied pressure, Blackpool got tired, sloppy and ended up dropping 2 points. 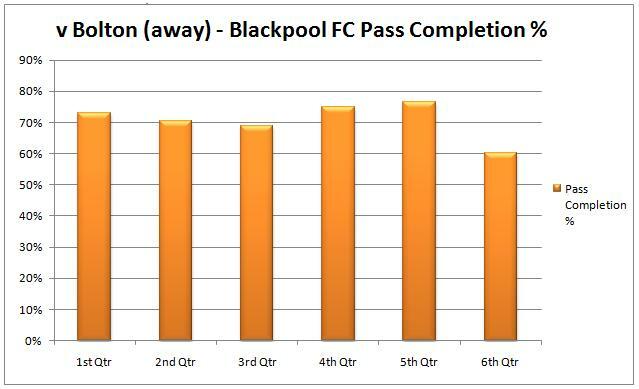 Quite simply, it appears to show that if Blackpool’s passing breaks down, then so does the team’s performance. When they’ve had their best passing periods, they’ve not conceded a goal. However, in three of the worst periods of passing Blackpool did concede goals. However, there are tales within a tale here. The Manchester City game is a good example of where Blackpool had a tremendous game on the ball, but served to back up the old saying about having possession is no good if you don’t do anything with it. One of the best pass completion periods came in that game and in fact the pass completion for the first three quarters of that game stood at 78% as Blackpool matched City, however, City introduced David Silva and the game swung away from Blackpool as did their pass completion, which slipped to a woeful 68% and the game was lost. As 2011 gets under way and as more teams (should) get more insight in to what makes Blackpool tick then Holloway and his team will need to work harder to keep that pass completion up in the high seventies and if they want to close out game instead of losing leads, then they’ll certainly be looking to do that or even get in to the low to mid eighties. That itself is a big task. This blog has made mention of the long diagonal ball that appears to be a signature of this Blackpool team, that doesn’t work every time and may be used more sparingly. However, two recent articles have shed light on how Blackpool may be able to keep the ball, increase that pass completion and perhaps assist in winning more Premier League games. In the January issue of World Soccer (no link sorry, you can still buy it I think), Paul Gardner reviews the use of the cross in the modern game, stating that that it no longer becomes an effective tool at the highest level of the game, citing the likes of Barcelona who rarely score their goals from ‘aerial ball delivered in to the penalty area from a wide position, but from no further than 30 yards away’. Blackpool’s season cross completion rate is 20%, which means that a total of 228 crosses have failed to reach a Blackpool player which is an average of 13 misplaced crossed per game equating to 3% of Blackpool’s total passes. Making the right decision when to cross and recycling the ball when we don’t have the right opportunity to cross could really benefit Blackpool, although it would place more emphasis on being more patient in attack and working the ball in between defenders for scoring opportunities. Added to this in a recent review of the Ajax team under new manager Frank de Boer, 11tegen11 suggested that Ajax were taking short corners in order to keep hold of the ball instead of putting the ball in to the box where the ball could be conceded to the opposition. Given that Blackpool only succeeds in hitting their men 34% of the time from corners then this might be a strategy for Blackpool as a total of 43 corners have been wasted this season and the impact of that is that Blackpool will inevitably concede valuable possession to opposition. However, as with the Sunderland game, the short corner can be useful in creating chances given that the angle of cross changes and can catch a team out who isn’t paying attention. All this is purely conjecture and at the heart of any improvement needs to be centred around player technique and it’s safe to say that Holloway will be striving to do this in every training session as well as improving players strength and composure on the ball so that ball is rarely wasted or the opposition manage to wrestle the players off the ball. It will be interesting to see if Blackpool continues along their passing path, if they maintain or even improve their current pass completion then another season in the Premier League beckons. However, become wasteful and fail to learn the lessons of the last quarter of the Bolton game and it might be a different story in 2011.